Describes seventeen fish that have peculiar characteristics and habits, including fish that spit, fly, climb trees, blow up like balloons, and sleep out of water. About Leonora Hornblow (Author) : Leonora Hornblow is a published author of children's books. 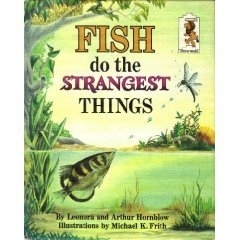 Some of the published credits of Leonora Hornblow include Fish Do the Strangest Things, PREHIST MONS/STRANGE TH (Step-Up Nature Books).